This is THE Arrington 426 HEMI Stroker long block, the foundation for most of our biggest and best builds. 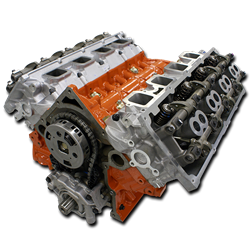 Based on the Chrysler 6.4L HEMI block, all of the moving parts are upgraded and forged to create a high-performance platform for forced induction, aggressive camshaft profiles, and other power add-ons. Starting with our 426 short block, we add our custom-engineered high performance cam package and our proprietary ported head and valve package with performance springs and lifters. Core charges for both the block and heads apply if you are not providing them for upgrade. Great power and top notch service! Very pleased with the power and drive ability of the 6.4 based 426.